This book includes almost one thousand radiobiology questions of A, B, and X format along with informative answers to assist in the preparation for board examinations. The questions are grouped under specific topics to facilitate the detailed study of areas of comprehensive descriptions. The exam consists of topics in molecular/mechanistic, cellular, normal tissue, and tumor radiobiology along with radiation risks and protection. All sections are suitable for both diagnostic and radiation therapy residents or instructors in radiobiology field. This compilation consists of questions from the past practice exams, which were introduced to help and assist residents in self-study and board exam preparation. 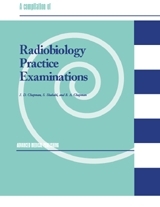 The book frequently refers its readers to the concepts of radiobiology and the application of those concepts to both basic and clinical radiation biology. This volume is a compilation of questions from 1995 to 1999. The questions from those examinations have been revised, updated, and reorganized into specific topics to make the review process easier. Answers are accompanied by brief explanations along with appropriate references.